For first time home buyers, homeowner’s insurance can be a frightful topic. The insurance industry as a whole is very confusing to deal with, and the requirement for homes to be covered adds to the complexity of closing the deal. Homeowners must be sure to arm themselves with plenty of information before deciding on an insurer to protect their home. Here are a few frequently asked questions to get you up to speed. Homeowners insurance is a policy that protects you against partial or complete loss of your home and the possessions inside. The main purpose is to protect your home against any unexpected damage that could make it unsafe to occupy your home, although it will also cover some other types of loss. Homeowners insurance covers four major categories of losses: property damage, property loss, personal liability and living expenses. Property damage includes the partial or complete destruction of the property caused by certain natural disasters or events like fires. Property loss includes loss of property due to burglary, theft or other damage. Personal liability covers accidents that occur on your property which may require medical treatment either for yourself or for someone visiting your property. Finally, living expenses coverage can provide for you and your family if you are forced to find alternate living space following a disaster. Each state has its own laws regarding homeowners insurance, however, almost all lenders require this insurance as a condition of closing the loan. As such, you will be required to forward proof of insurance to the lender before they will sign off on the closing paperwork. Homeowners insurance can be paid for in several different ways. If you wish to pay for insurance yourself, you may pay the whole premium at the beginning of each renewal period, typically a full year at a time. On the other hand, many lenders prefer that you make payments to them with your mortgage payment each month so that they can make the full premium payment themselves. This helps them verify that the insurance policy stays current and protects them against loss as well. It also simplifies payments so that you won’t have to fork over thousands of dollars each year at one time. The cost of homeowners insurance varies depending on certain attributes of your house. For instance, the insurance company will consider the cost to replace your home with a home of like size and style in the event of a total loss. They will also consider whether or not your home is located in an area prone to natural disasters. They will evaluate electrical and other systems in your house to determine if they are up to date and carry additional risk. Finally, they will set limits for the personal property based on any personal collections or high-value items that may be located inside the home. All of these points are added up to determine your annual cost. 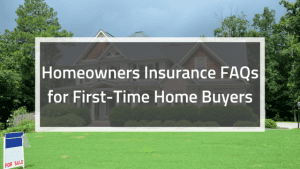 These are just a few of the most frequent questions we receive about homeowners insurance and how it impacts first time homebuyers. The more information you have in advance, the easier it will be to shop around for the best rates and find the right level of coverage for you and your family.